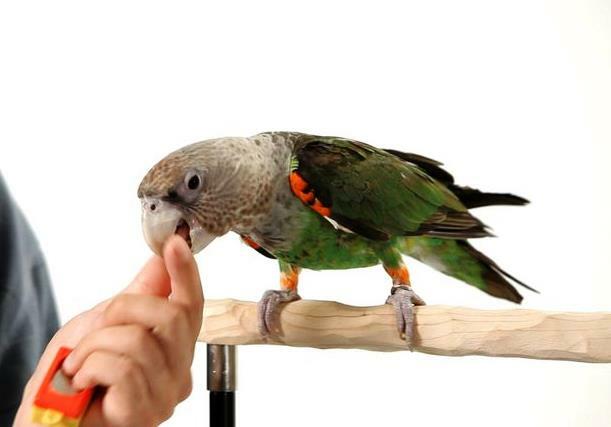 Hold their treat/reward in your fingers then move it up and down to get their attention so that they will follow your fingers , their head will move up and down . If they do it right , you need to say ” nod ” immediately .Continue to repeat that action, your bird will follow and step by step , they will understand the situation . A number of birds will have nice shape when they do a bow and if such training is very good by taking your finger gently pressed their body during training exercises to adjust better shape . Option 1 : The most slowest and simplest way . Hold their treat/reward in your fingers then move it from right to left to get their attention so that they will follow your fingers and shake their head , at the same time say the order “shake ”and give them bonus . Continue to repeat that action until they do correctly what you want . This method requires patience and a long-time practice. Option 2 : Say “Shake” and blow across their nose or their feathers. Most of the birds will naturally respond and shake their head –>Clicking “click” –>give them bonus .Continue to repeat that action until your bird understand the situation and do when you order .